Dockage available end of May at 90' dock for yachts to 112' on the South Fork of the New River east of I95. Reliable marina grade power is single and 3 Phase, 2 x 100 amp and 2 x 50 amp. Excellent water pressure through 2" dedicated line direct to the dock. The dock is well maintained and well lit with your own private entrance from the road. No fixed bridges to the ocean, close to down town Ft. Lauderdale, with fast links to the airport, I95 and local shipyards. 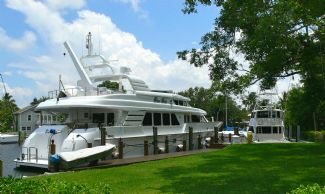 Great location for brokers showings; several yachts have sold from our docks! No live-aboards. $1 a foot a day. Minimum monthly $3000. Please email Susan at [email protected] for more information and photos.